After passing over Beathtooth Pass, Carol and I spent several days visiting Yellowstone National Park – not near enough time. 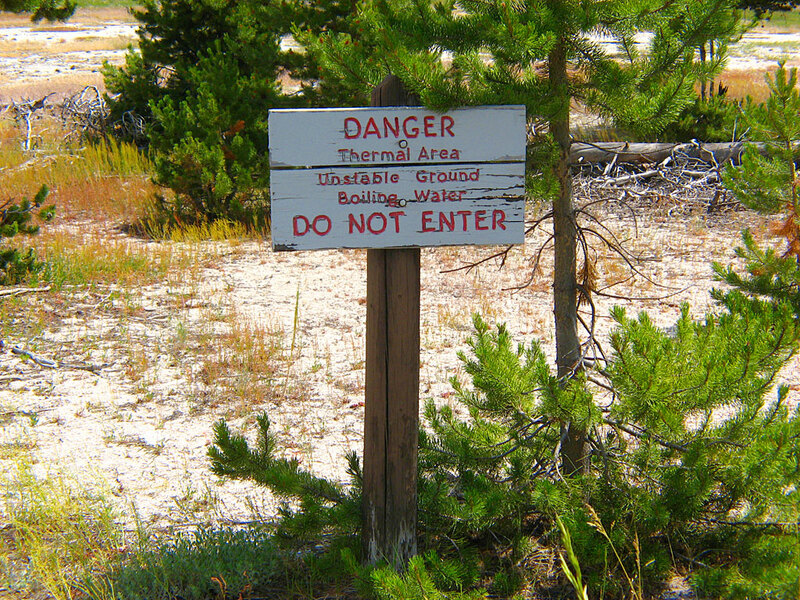 Our base camp was at Slough Creek CG. 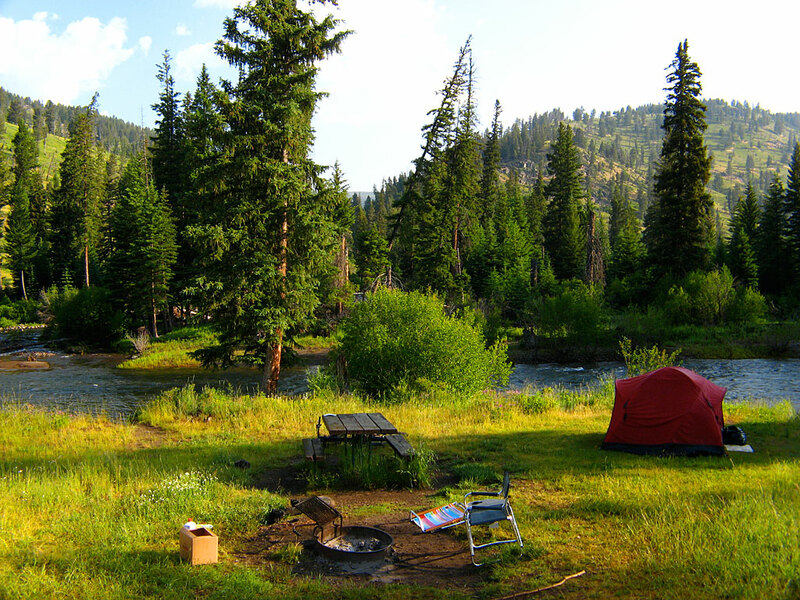 Our camp site at the intersection of Buffalo and Slough creeks. If you forget to make your food bear safe, a friendly ranger will remind you at 2 a.m. 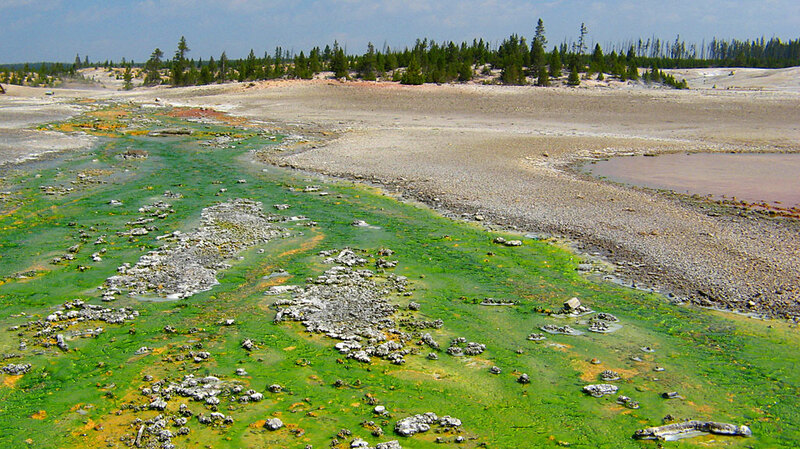 Many different colors of algae flourish in geysers’ hot-water outflow. 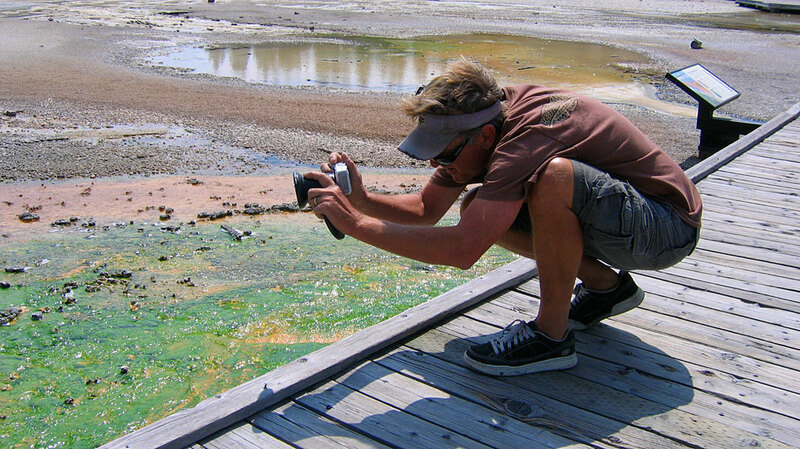 The green algae (Cyanidioschyzon) thrives in extremely toxic conditions, and chemically modifies arsenic which occurs naturally around hot springs. 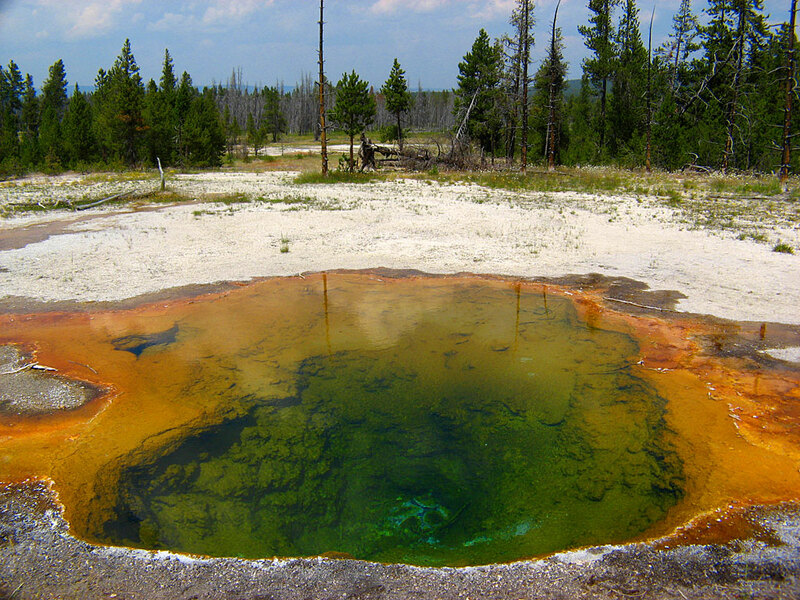 Half of the world’s geothermal features are located in Yellowstone. 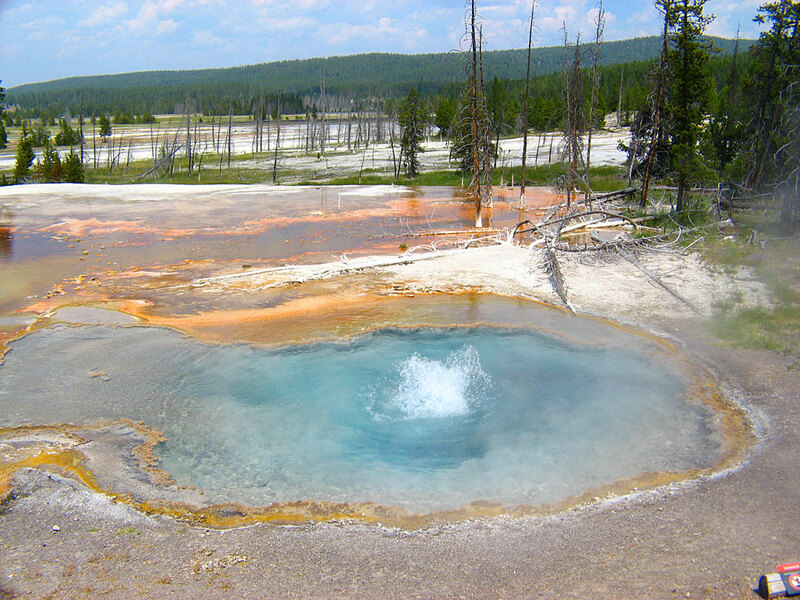 Yellowstone was the first of the National Parks, created on March 1, 1872 by President Ulysses S. Grant. 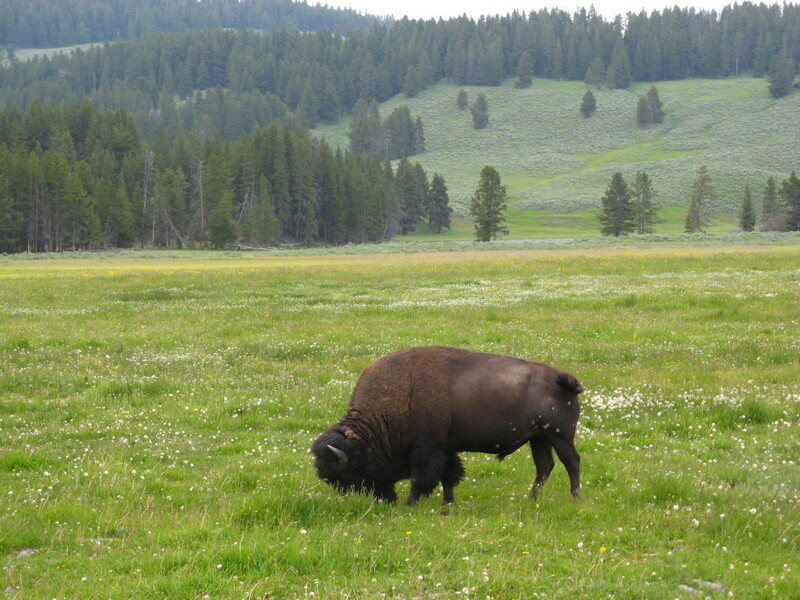 We saw lots of animals while visiting Yellowstone: many deer, elk and buffalo, coyotes, and even a few wolves. 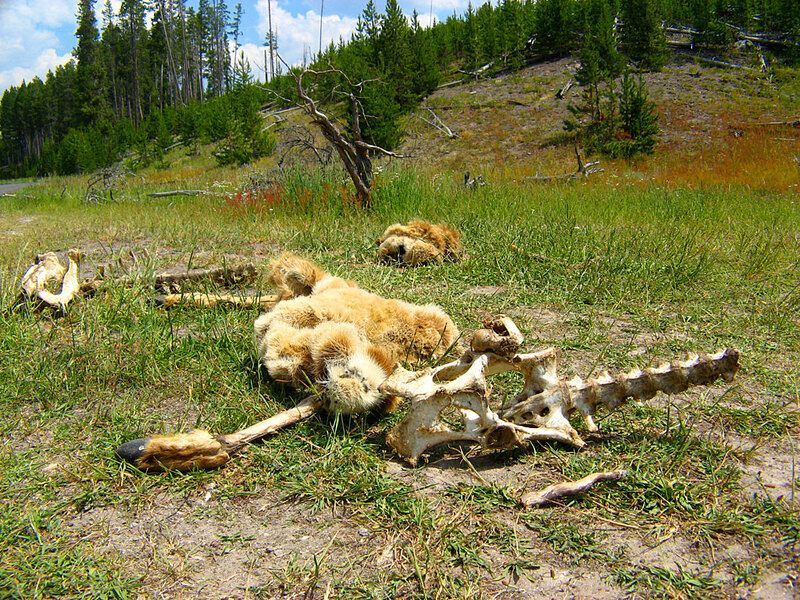 Perform a web search for “yellowstone buffalo gored” – Darwin insures there’s plenty of death and carnage in Yellowstone. 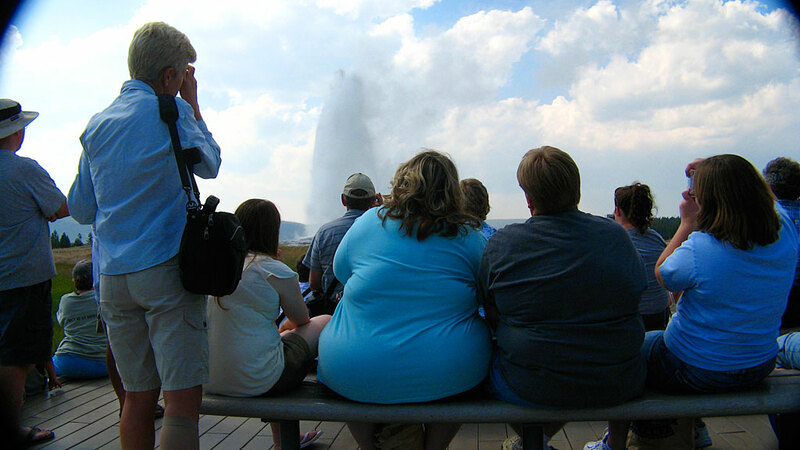 Carol gets a shot of Old Faithful Geyser. 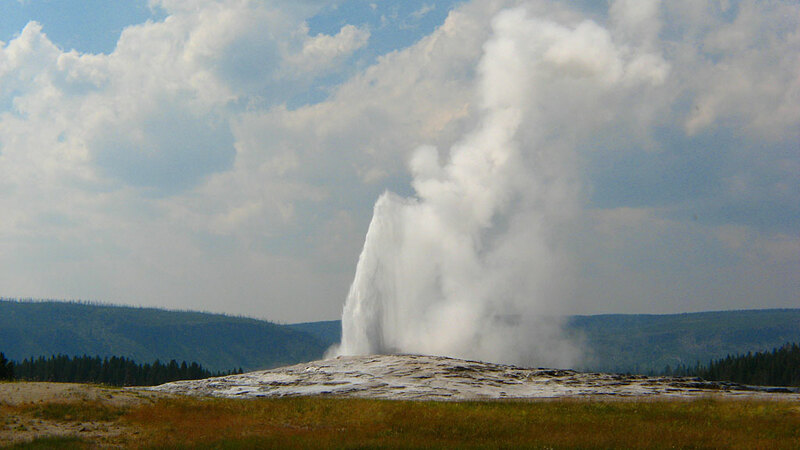 My shot of Old Faithful. 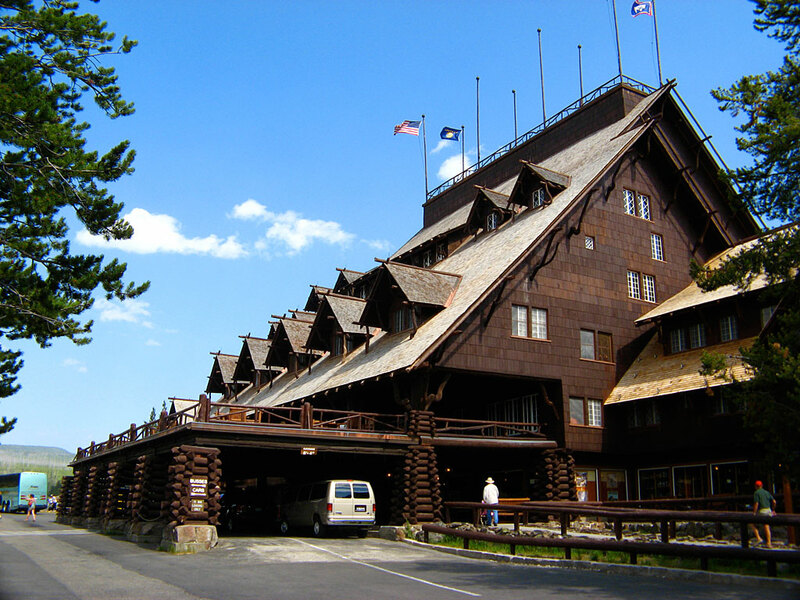 Old Faithful Inn opened in 1904. 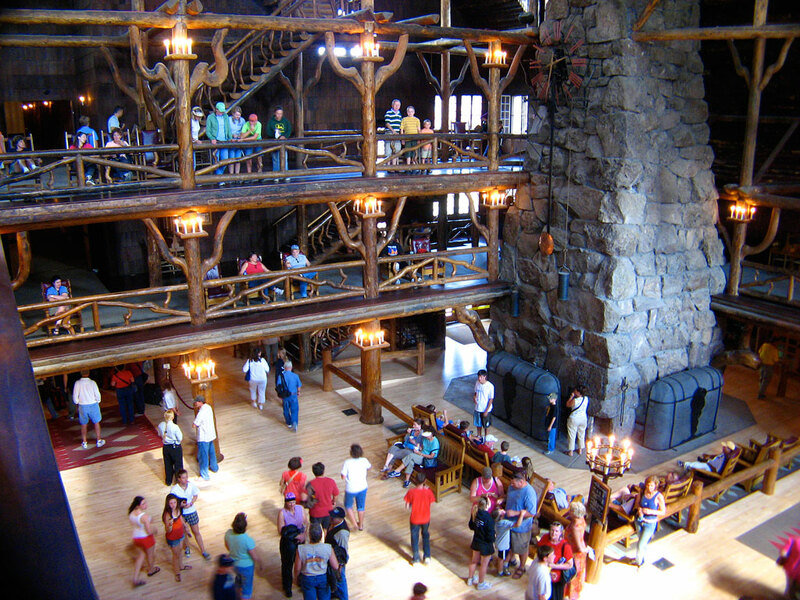 Wikipedia: With its spectacular log and limb lobby and massive (500-ton, 85-foot) stone fireplace, the inn is a prime example of the “Golden Age” of rustic resort architecture, a style which is also known as National Park Service Rustic. 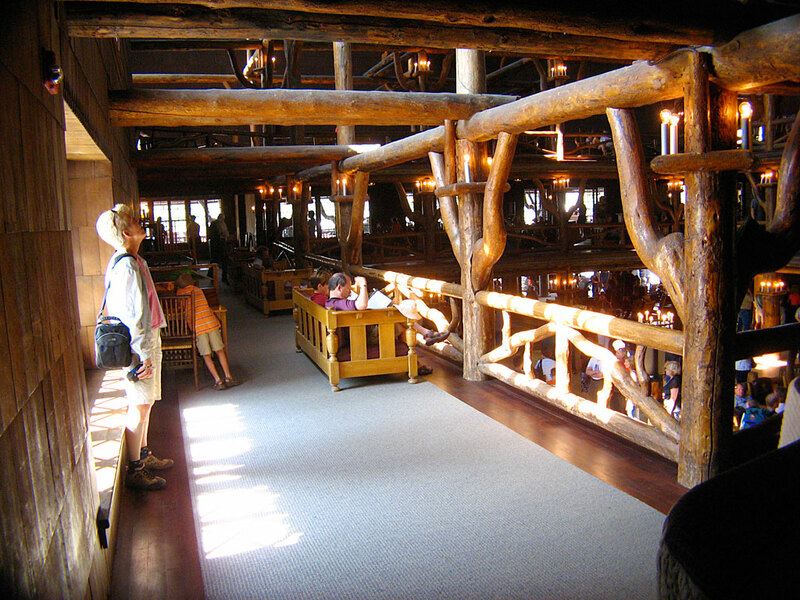 It is also unique in that it is one of the few log hotels still standing in the United States. It was the first of the great park lodges of the American west. The interior of The Inn contains four stories of balconies, but only the bottom two are open to the public. 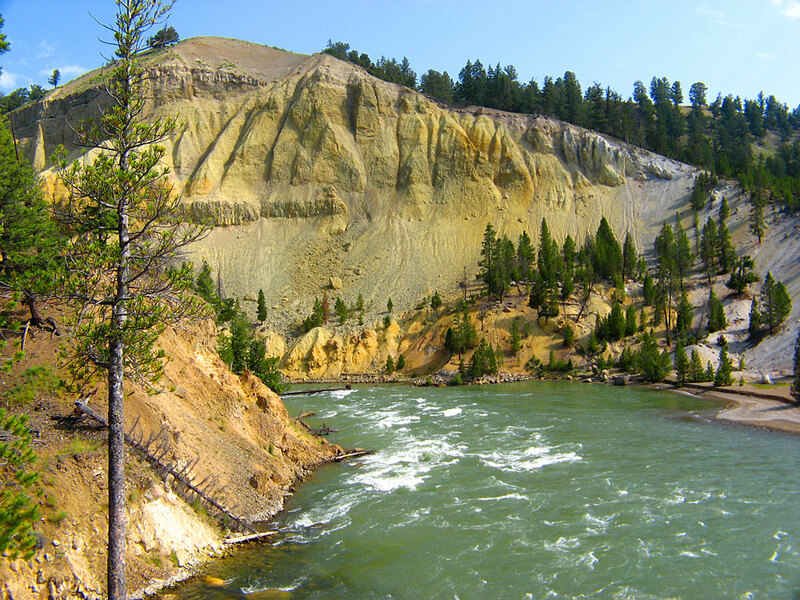 The Yellowstone River from Tower Fall trail. 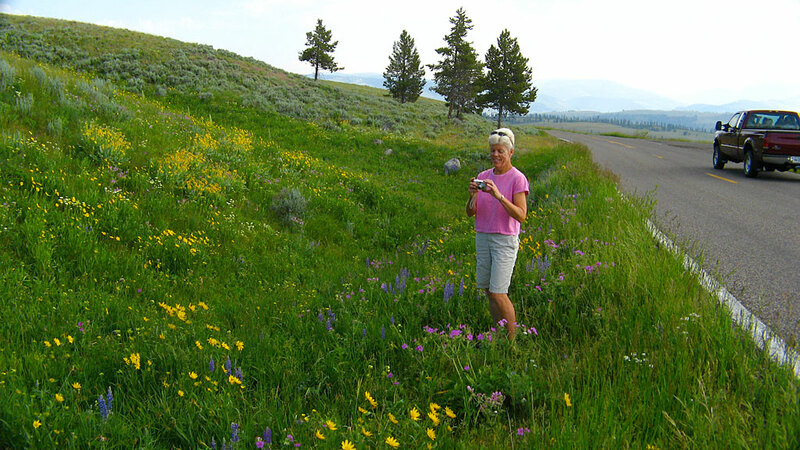 It was hysterical – we’d occasionally stop to take photos of something, in this case the wildflowers, and others would slow down and stop on the highway, thinking we’d made a buffalo or elk spotting. We created a bear jam.